2006 Field School unit excavation. In August 2006, Missouri State University’s (MSU) Center for Archaeological Research (CAR) entered into a Challenge Cost Share Program cooperative agreement with the National Park Service-Trails Division Intermountain Region to locate and identify the northern route of the Cherokee Trail of Tears in Greene and Christian counties, Missouri, and to investigate two archaeological sites associated with the Trail of Tears. This research was conducted to further historic and archaeological knowledge of this major event in U.S., and Cherokee history and to aid in the preservation and protection of these cultural resources. The Cherokee Trail of Tears was a monumental event in both U.S. and Cherokee histories. As a result of many years of treaty negotiations and U. S. policies regarding the treatment and disposition of American Indians as early as 1776, its effects were far-reaching. With the initiation of the Indian Removal Act under President Andrew Jackson’s administration in 1830, forced removal was less than a decade away. In 1835, a small, unauthorized faction of Cherokee signed a treaty with the U.S. in New Echota, Georgia. The Treaty of New Echota was ratified by Congress in 1836, and ceded all Cherokee lands east of the Mississippi to the U.S. in exchange for $5,000,000 and lands in eastern Oklahoma. Fifteen thousand Cherokee opposed the treaty by signing a petition, but were unable to sway the decision. Using ground penetrating radar to study subsurface disturbance of Wilson Cemetry. The Treaty of New Echota gave the Cherokee two years to remove themselves voluntarily. Voluntary removal began in 1837, though only a small group of Cherokee participated. Jackson’s administration initiated forced military removal and by July 1838, more than 13,000 Cherokee were held captive in military stockades. The Cherokee traveled to Indian Territory over both water and land routes, collectively known as the Trail of Tears. During this time, Springfield was becoming a gateway to the west and the intersection of several major transportation routes (the Springfield-to-Fayetteville Road, the Old White River Road, and the Springfield to St. Louis Road) made the James River even more attractive for agricultural and business pursuits. The Springfield-to-Fayetteville Road and the Old White River Road, connected on the east bank of the James River, below the bluff line. James Wilson, a Euroamerican trader, accompanied the Delaware to the James River, or West Fork of the White River as it was named at that time. Wilson served as an interpreter until his dismissal by Indian Agent Major Richard Graham of the Department of Indian Affairs, U.S. War Department (Cooley et al. 1975:67; Rees, Powell and Lopinot 200:21; Weslager 1978b:215). Wilson’s Trading Post (23CN571) is depicted on O’Connor’s map of the Battle of Wilson’s Creek (Greene County Archives) north of the Yoakum Mill Road near the confluence of the James River and Wilson Creek. Just below the trading post site, O’Conner shows "Wilson’s Cemetery" (23CN750). The Old White River Road crossed through this section, near the former Delaware settlements to the south and southwest. Archaeological investigations of these two sites were conducted in 1999, 2000, 2006, and 2007. Grave marker at Wilson Cemetery. Elizabeth Wilson, a French woman from St. Louis, married James Wilson after the Delaware removed to the present-day Kansas City area (Escott 1878:17). According to the probate records, James Wilson died sometime in late May or Early June of 1834. It is highly likely that he is buried in Wilson’s Cemetery (23CN750). Neighbor William Dye assisted the widowed Elizabeth in the probate of her husband’s estate on several occasions. Mrs. Wilson also paid Mr. Dye to build a coffin for a deceased 14-year-old female slave she had borrowed from fur trader William Marshall. Marshall operated a trading post at the confluence of the James and Finley rivers. It is possible that this slave may be buried in Wilson’s Cemetery as well. Based on the General Land Office (GLO) 1835 plat map, William Dye and Elizabeth Wilson owned a tavern in the northeast one-quarter of Section 1, T27N, R23W. In this section of the map is an image of a structure with a sign that says "tavern." In the GLO 1835 survey field notes, written in the margin, is a statement, "Wm Dies and Mrs. Wilson’s Stand." During this time period, rest stops, taverns, and inns along wagon routes were often called "stage stands." The White River Road, which served as the Trail of Tears route, also crossed through this quarter section. The first known mention of this location (23CN571) as "Bell Tavern" appears in the 1837 diary of Dr. W. I. I. Morrow (1839), a conductor for a Cherokee detachment on the Trail of Tears. The detachment stopped at "Mr. Dye’s [Bell Tavern]" on March 14, 1837 (National Park Service 1992:74). Conductor B. B. Cannon also recorded camping at Mr. Dye’s on December 17-20, 1837 (Cannon 1978:158-163). During this brief stay, Cannon noted that they "buried Dreadful Water this evening." Wilson’s Cemetery (23CN750) lies adjacent to site 23CN571. The remains of Dreadful Water and perhaps other Cherokee may be interred in this cemetery. In 2006 and 2007, the MSU Archaeological Field School conducted research at Wilson’s Trading Post to confirm the site’s function as a trading post and later, a tavern or stage "stand." The site was heavily tested and excavated using metal detection, systematic shovel testing, and formal excavation of eleven test units. 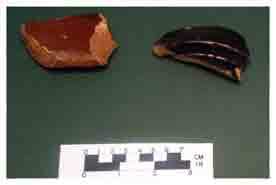 A total of 11,024 artifacts was found, many of which are consistent with a trading post and tavern site. Items such as pearlware, a type of refined earthenware, stoneware typical of the eighteenth and early to middle nineteenth centuries, glass fragments, square nails, and the over 42 limestone foundation stones best represent the historic component of this multi-component site.